Fishing for Beginners, Backpackers and Budget Travellers at rates you can afford. The Trout Man tailors tuition trips for ages 9 to 90 and teaches many senior citizens. He also introduces women to fly-casting and young children to spin-fishing. All tackle is provided. Extra time is $20 an hour. Costs do not include fishing licences. All tackle is provided. Getting Started : Flycasting tuition and fishing on tranquil streams and lake-edge, learning the basics. Three hours $75 1person. Four hours $100 1 person/$125 2 persons. Where and How: A time-saving two-hour familiarisation trip around local fishing spots for visiting anglers, learning where to go and what to use. Up to three people $55. Four hours, including the Rotorua Lakes region, $100. 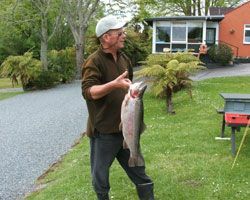 Winter Special: 6 hours during the peak spawning season at peaceful Lake Rerewhakaaitu. $150 1 person / $170 2 persons.